I have written previously about how important it is to have a vehicle inspected by a mechanic before purchasing. In a perfect world, nobody would buy a car without having it inspected. There are, however, times when that is not feasible or realistic. One of those times is when buying a car at an auction. So, the question that comes to mind is whether it is a good idea to buy at an auction. The view and opinions that follow are my personal opinions, based on what I have seen. 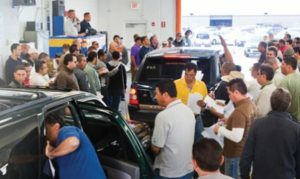 I have spent many hours during my career at auto auctions, these auctions, however, have been dealer auctions. I have seen times when a car could be purchased with a moderate amount of confidence as well as times when it was a total “Buyer Beware” environment. That is with many years of experience in the auto repair field and having the knowledge of what to watch out for. As many of you know, I previously sold cars here at R&L Automotive, along with my auto repair business. As things evolved at the dealer auction, the ability to buy quality inventory became so difficult that I chose to discontinue that part of my business. I felt that if I could not provide my customers with good, dependable cars at a reasonable price, nobody was coming out of the deal in good standing. How does that compare with the other auctions where private individuals can purchase cars? At the dealer auction, there is a test track to drive your potential purchase. The problem with that is that many issues don’t show up on a short test drive. There were multiple occasions that I purchased a vehicle that ended up having major issues that did not appear until after driving for 30-45 minutes. Does the auction you are buying at even have a test track to test drive the cars? Most private auctions do not. I am not sure if I would buy a car at an auction or not after my history with buying headaches. It is always a little bit of a gamble when buying any used car, even if you can have it checked by a mechanic, as they say, nobody has a crystal ball. Of course, there are deals to be had at an auction, the question is, will the car you buy be “the deal of the century?” My general feeling is that there is a reason that car is at an auction. In the past cars with over 100,000 miles, good or bad, showed up at auction. That was particularly the case with the dealer auctions, the new car dealers did not mess around with trade-ins with over 100,000 miles, they simply wholesaled them. The used car market has come to be a very strong market in the last decade, not only do people tend to keep cars longer, but new car dealers tend to keep the ‘cream of the crop’ trade-ins. That narrows the likelihood of finding a great car at a great price. I have had customers in my shop that have bought the proverbial headache at an auction. In both instances, the vehicles had serious engine problems. I replaced the engine in one of those vehicles. The other person discovered the heater core leaked after purchasing the car. It was scheduled to have me replace the heater core, but the engine developed a serious lower engine knock on the way to my shop. The repairs would have exceeded the value of the vehicle, so the customer declined any repairs. I spoke with that customer later and learned that the auction had given him some restitution for his problems, but nowhere near what he paid for the car. I do not want to give the impression that the auction is knowingly selling problem vehicles. They have no idea; the auction offers a service for sellers to sell vehicles and buyers to purchase. They do not have the responsibility of the ability to inspect each car that goes through the auction. A person buying a car at the auction must understand that ‘what you see is what you get’. The problem is that you also get what you cannot see. The unfortunate thing is that indeed, many sellers do know what they are selling, and, as they say, laughing all the way to the bank. That puts the responsibility on the buyer to know what they are buying. In an auction environment, that is a very difficult task. It is likely that you will not be able to drive the car. You certainly can’t have your mechanic do a thorough check for you. You may be able to get a mechanic to go to the auction and give you an opinion, but that is all he would be able to do. I would recommend taking a scanner and getting a read from the computer of any car you are looking at while at the auction. Insurance auctions are another source for possible values. I have seen some pretty good deals that acquaintances have negotiated at insurance auctions, but again, you can see the damage that made the insurance company declare it a total loss, but you cannot see what else might be hiding there. If the visible damage is the only issue with the vehicle, you might do well, but did the car have other problems before the impact? I am not suggesting that there are not dishonest people on craigslist or used car lots selling headaches, but at least you can have your mechanic check it out before you make the deal. That doesn’t give you a guarantee, but at least you have a fighting chance. Whether you decide to buy a used car from a private party, a dealer, or an auction, please be careful and do everything that is available to know what you are buying. The right used car can last you a very long time, the wrong one can break the bank. Personally, I doubt I will ever buy a new car again, but I am very careful when buying used cars. Do your due diligence, know what you are buying. Do not get in a rush. The car you are looking for is out there, however, there are also many that could be the wrong choice.